Going Places with J: Where Do You Live? I live in Cali, a city in Colombia not California as some people have confused. 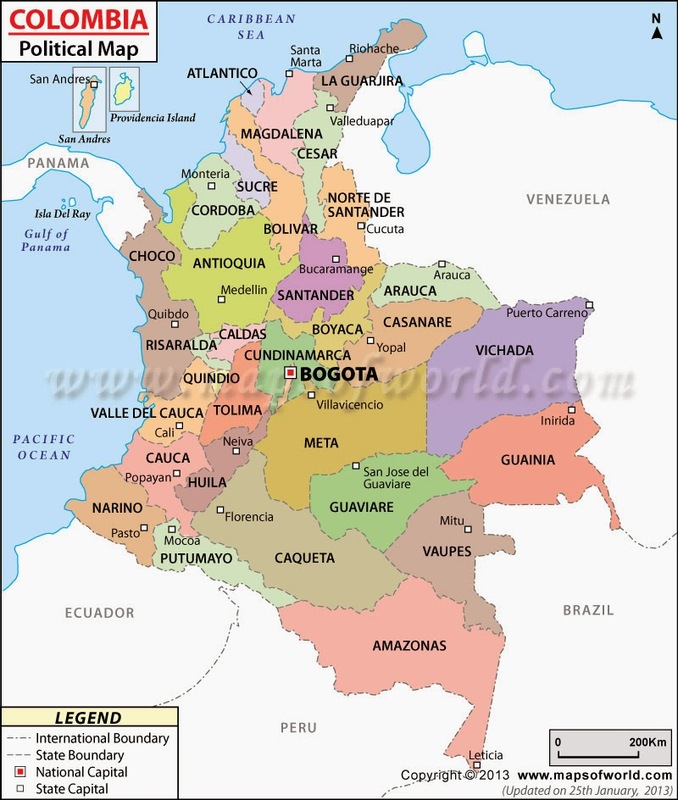 Colombia is divided into 32 departments and each department has its own capital. I live in the capital city of the department of Valle Del Cauca, Cali and my neighborhood is called barrio Las Granjas. Currently I am visiting Medellin the capital of Antioquia department but in a few days I will be back to good old salsa loving Cali. That's it folks, nothing much to write about today but I just wanted to give you an idea of where I live for those who have asked me where exactly Cali is. I felt like such a proud kid not too long ago when I was able to proudly state the department I live in and the city, including my neighborhood and street during a conversation I had. Last week I went to watch soccer with my host and his friends. It was Colombia versus Brazil and my host kept cheering on one player and every time he would say his name it sounded like "Chairman." After the game I asked him if the player's name really was "Chairman" and he said yeah, that was the guy's real name. Well, the player's name did come up on the screen eventually and guess what it read? "Sherman." We ended up laughing about the differences in pronunciations between English and Spanish speakers. It's customary to have your father's and mother's last names and these are called apellidos, meaning surnames they are not really considered your names. Your own name of course comes first. Not everyone though has both their father's and mother's last names, it depends on the circumstances. I had to use a public toilet today and there was a guy handing out toilet paper to the ladies as they went into the bathroom. His hand was in direct contact with the paper itself as he would roll it out and hand it to whoever needed it. I crossed my fingers that I wouldn't have to make an appointment with a gynecologist later on........hey! you never know where those hands have been. I'm I overreacting? I went to downtown and stopped by a women's clothing store just to see what they had on sale. The shop was playing really good salsa and even though I didn't see anything I liked, I lingered on just to enjoy the music. I have seen people make out in the metro like their lives depended on it. I'm not hating but damn, get a room. When sound effects start coming into play you kind of wonder how far things are going to go, I am just trying to get to my location not witness some soft core action.